Facts and history about Native American Indian stereotypes. Stereotypes relate to the generalized, unfair, oversimplified characteristics and fixed ideas about a particular group of people that held by a number of people. The early depictions of Native American Indians were as whooping, warlike savages who lived in 'wigwams', painted their faces, wore feather headdresses and hunted buffalo. American Indian Stereotypes were perpetuated by early Presidents, politicians, soldiers, journalists, artists, advertising men, movie men and writers of pulp fiction. American Indian stereotypes resulted in discrimination, prejudice, racism, misconceptions and ignorance about the indigenous tribes of North America. What are some stereotypes of Native Americans? 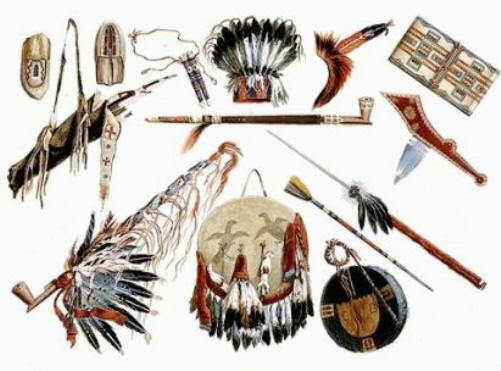 Examples of some stereotypes of Native Americans include strong associations with specific items such as feather headdresses, tepees, wigwams, moccasins, bows and arrows, war paint, tomahawks, drums, deerskin clothing, pipes, wampum and coup sticks. People also served as stereotypes with titles such as Medicine Men and Chiefs, and generalized names such as Squaws, Savages, Renegades, Half-Breeds and Bucks. Certain denigrating and derogatory characteristics were also assigned to Native Americans such as savage, dangerous, uncivilized, lazy, bloodthirsty, drunk, cruel, dirty, stupid and hostile. Stereotypes are gross misrepresentations of American Indians by the dominant white society that contributed to a casual attitude and disregard of injustices that were upon heaped this minority group of people. There were over 500 tribes spread across the whole of the North American continent from the Arctic Inuit tribe (eskimos) who wore parkas and lived in igloos, to the Woodland tribes of the Iroquois Confederacy who utilized birch bark to build their longhouses and make their clothing. The agriculturists such as the Southwest Pueblos who lived in permanent villages raising the 'Three Sisters' crops of corn, beans and squash and the tribes who lived in the hot, inhospitable desert areas. Despite the massive variations in culture and lifestyle, the typical American Indian Stereotypes were all associated with the nomadic tribes of the Great Plains such as the Sioux, Cheyenne and Blackfoot. A totally incorrect assumption which led to the acceptance of American Indian Stereotypes. The widespread acceptance of American Indian stereotypes were fuelled by the concept of Manifest Destiny. The notion of Manifest Destiny encompassed the belief that it was the divine right of the American people, who believed that they were culturally and racially superior to other nations, to bring civilization and enlightenment to other races. This belief was perpetrated by early US Presidents and politicians who encouraged Westward Expansion. The early movies and TV series played an important role in perpetuating the notion of American Indian stereotypes. Tribes were depicted as terrifying, painted hostiles preying on civilized white folks. Movies that portrayed these negative stereotypes included the 1956 movie 'The Searchers' starring John Wayne with a plot based on a massacre and abductions by Comanches. The 1940 movie 'Northwest Passage' starring Spencer Tracy depicts hostile Mohawks and Abenakis. The 1939 movie 'Stagecoach' again starring John Wayne in which the travellers were under threat from Apaches led by Geronimo. The 1963 movie 'How the West Was Won' portrays attacks by the Cheyenne and Arapaho tribes and the much loved musical 'Calamity Jane' starring Doris Day depicts numerous instances American Indian Stereotypes. Before the movies Buffalo Bill and his Wild West Show, and similar shows, toured America and Europe. The show featured mock battles between the White Man and the Indian. The famous Sioux leader Sitting Bull took part in Buffalo Bill's Wild West Show. The famous Apache leader Geronimo appeared at the St. Louis Exposition with a "Wild West Show". 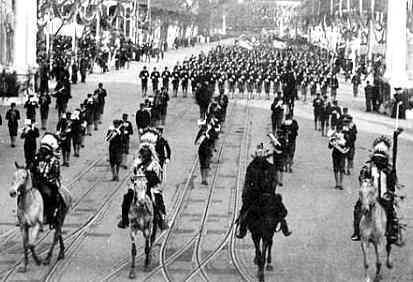 Geronimo also appeared in other Public exhibitions such as leading President Theodore Roosevelt�s Inaugural Parade in 1905. He was accompanied by other chiefs all wearing stereotyped clothing and headdresses. A favorite game of kids up to the 1960's was 'Cowboys and Indians'. The Cowboys were always the good guys and the Indians were the bad guys. They dressed in stereotyped clothing and played around a wigwam (which was actually a tepee). Women were often depicted as Indian Princesses in Disney movies such as the 1953 'Peter Pan' and the 1995 Pocahontas. There were no Indian Princesses - early leaders of tribes were accorded the title of 'King' by British monarchs and their daughters automatically given the title of 'Princess'. American Indian Stereotypes Fact 2: Injuns: To make matters worse the word "Injun" is an intentional mispronunciation of the word "Indian"
American Indian Stereotypes Fact 4: Wigwams: The term 'Wigwam' was used to describe all Native Indian homes, regardless of structure, location or cultural group. People to this day are still confused between the difference between a wigwam and a tepee. There were many types of dwellings used by tribes, depending on the location, natural resources and climate - on this website we have described nineteen different types of homes. Overuse of the term "wigwam", and the perception of its meaning, added to the stereotype of Native American Indians as "uncivilized" savages. American Indian Stereotypes Fact 10: The early depictions of Native American Indians in 'Wild West' shows, old western movies, books, photographs and television series resulted in widespread stereotyping.